Before the concert, I had a very pleasant dinner with a dozen or so Counter-Currents writers, readers, and friends, plus people from the overlapping Traditionalist, Asatru, and Neo-Folk/Martial-Industrial subcultures. 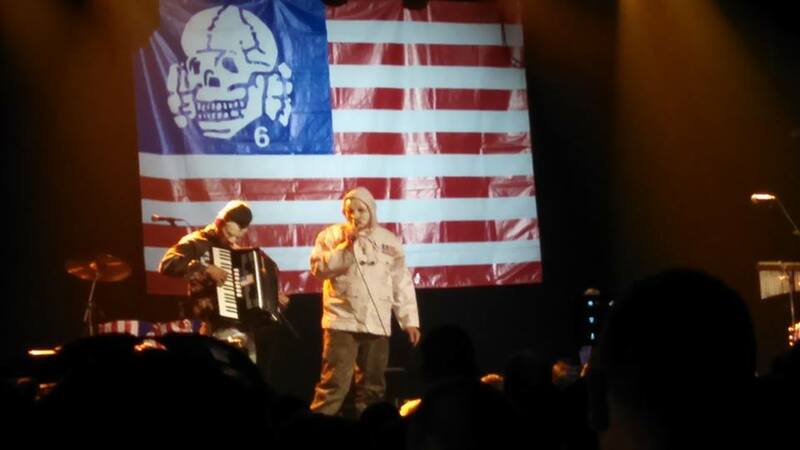 The concert opened with keyboardist Miro Snejdr sporting a camouflage uniform and Hitler-Jugend haircut playing instrumental versions of popular Death in June songs. Then Snejdr donned a cap and mask and picked up an accordion as Douglas P. made his entrance wearing his signature mask, ringing a bell, and brandishing a bouquet of roses given to him by one of our dinner group. Together they played “Leopard Flowers” plus “Life Under Siege,” “Wolf Rose,” and “Peaceful Snow” from Death in June’s best album in many years, Peaceful Snow , which features Snejdr on keyboards. Then Snejdr retired as drummer John Murphy took the stage and Douglas P. took up his guitar for a more conventional set of DI6 favorites (“Rose Clouds of Holocaust,” “Luther’s Army,” “She Said Destroy,” “Death of the West,” “But, What Ends When the Symbols Shatter?,” “All Pigs Must Die,” “Tick Tock,” “To Drown a Rose,” “Little Black Angel”) and a couple of new ones (one apparently called “Taqiyyah “). On the whole, it was an excellent, spirited concert, but I particularly enjoyed Snejdr’s portion of the program because his keyboard and accordion accompaniment better revealed the beauty of the songs’ melodies than the stripped down drum and acoustic guitar arrangements. Perhaps I am just getting old, but I also found Murphy’s amplified drumming oppressive. (I brought earplugs to take the edge off.) I definitely vote for a DI6 “unplugged” tour. Although there was heavy security at Webster Hall, for all know it could be standard. There was no sign of “antifa” activity, although I am sure there were emails, tweets, and fake reports of violence and vandalism as there were in San Francisco last September. By my count, there were 300 of so people present. It was an interesting crowd. As in San Francisco  last year, the audience was youngish (mostly under 30 — i.e., Douglas P. is older enough to be their dad ), overwhelmingly white (with a few Asians thrown in), about 70% male, and, judging from the couples, mostly straight (with a few visible homosexuals as well). I was also impressed by the number of really good-looking, well-dressed people, some of them with Snedjr’s haircut. Still, the majority of the people there would probably reject such labels, even the ones with those haircuts, plus runic pins and tattoos, etc. These are clearly signs of a broadly “folkish” consciousness. But why the devices of ironic distance? Why the apparatus of denial and evasion? Why do people wear Totenkopfs camouflaged with American and rainbow flags? Why do they carefully craft life trajectories through thought worlds and subcultures that occasionally take them into restricted airspace, from which they then veer back closer to the mainstream? Of course an ironic pose gives one deniability. And the existing apparatus of social sanctions is sufficient to explain that. Which implies that if sanctions lessen and if the subculture grows in size, cohesiveness, and power, then perhaps it will become more earnest and more straightforwardly political — as opposed to a virtual world which occasionally materializes in space-time so two people wearing Totenkopfs can look at one another but never summon up the courage to actually introduce themselves. The big question in my mind, though, is whether there are other factors at work here besides mere external social repression. Is there anything that the New Right can do to politically catalyze such implicitly folkish and apolitical subcultures? Until we answer that question, I am afraid that many of our people, like Douglas P., will only step forward camouflaged and in masks.